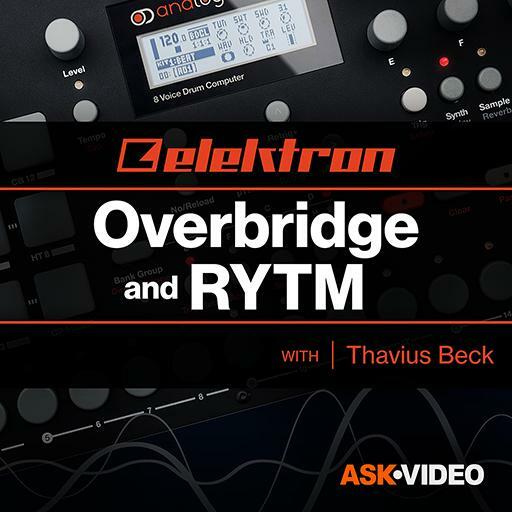 Elektron 101 - Overbridge & RYTM. True or False: A samples start point can be placed after the end point. True or False: Overbridge has unlimited bandwidth over USB. True or False: A percussive sample can be made into a melodic instrument by making a small loop. True or False: RYTM has Delay, Reverb, and Chorus effects. What benefits are there when sequencing RYTM from MIDI tracks in Live? True or False: Scenes in Live are the same as Scenes on RYTM. What are the Sidechain inputs used for in Overbridge? What are Trig Conditions used for? True or False: It isn't possible to record just the output of the effects from RYTM. Can the effects on RYTM be automated? True or False: The LFOs in Overbridge can access every single parameter in Overbridge. True or False: RYTM's Chromatic mode lets the user choose specific scales. True or False: Analog RYTM is a 12 voice drum machine. Can Overbridge parameters be automated? Is it possible to save the settings on RYTM with the current project in Live? Is it possible to record individual tracks from RYTM into a DAW via Overbridge? True or False: Overbridge will work alongside your current audio interface on a Mac.